Question of the Week: – What’s the one haircare tool you never travel without? Answer: – My travel hairdryer! My big sister bought me this one last year after experiencing the ‘pleasure’ of using my old clapped out one for a week while she was over from Australia. I love the Babyliss, it’s a 2000W powerhouse and sorts out my unruly mop in record time. Phyrra – rocks out with Make Up For Ever’s Rock For Ever Palette. Vampy Varnish – not only do you need to read the series but you also need to check out the new China Glaze Colours From The Capitol collection inspired by The Hunger Games. we heart this – Hey LA, if love animals, and want to score a gift bag worth $250 (filled with the likes of MUFE, Benefit, BPAL, Urban Decay, Murad and more) then you simply MUST join us this Sunday at the raffle we organized for the Amanda Foundation! 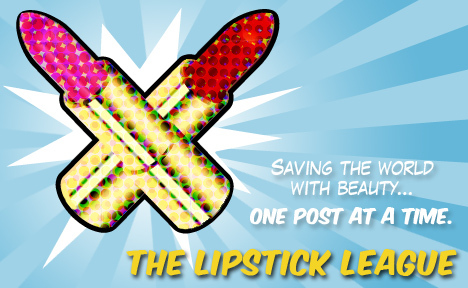 Clumps of Mascara – has found a hot pink lipstick that is rocking her world. Gouldylox Reviews – I love a good DIY project. Check out the great looks you can get from a headband worn “80’s Physical-style” and a tube sock. Krasey Beauty – tests out the WEN by Chaz Dean haircare line. Find out if it made her hair silky silky smooth! Nouveau Cheap – The new Almay Intense I-Color Shadow Sticks promise all day, crease-proof wear. But do they deliver? Come see! Prime Beauty – is calling all Drama Queens! You SIMPLY HAVE to try the Three Custom Color Daytime Drama Palette—I DIE! But seriously, you WILL perish if you don’t at least see the pics. What’s the one haircare tool you never travel without? If, by travel, you mean leaving the house in general, then hair binders. I always like to keep a few in my makeup bag. Just in case. Also, a few bobby pins. For longer travel, like on vacation, I pack a paddle brush to get out tangles. And my flat iron. The real steal: Two fragrances that belie their price tags! Perfect Hair and Make Up for a Job Interview!